When it comes to payroll services, it might feel like there are endless options out there. Which one is right for your small business needs? Here is what you need to know to make the best choice for your company and what you need to keep in mind to avoid payroll processing headaches. As with any business decision, carefully evaluate the needs of your company. If you have fewer than 10 employees in one location, your payroll needs will be vastly different from an operation with 50+ employees in various states or one that employs people who work on contract. Be realistic about the services you need. Do you simply need to process paychecks and get them printed, or do you need help with tax payments and filings too? Does it make sense for your company to have a web-based system or would a more traditional approach to small business payroll processing serve you better? Many factors will come into play when considering your options. Accessibility, affordability, and customer service are likely at the top of your list, but if the payroll service you choose doesn’t meet all your basic needs, even the most highly recommended company won’t help you. Remember not to get too distracted by services your employees don’t need (or won’t use). While selling-points like mobile access or employee self-service sound great, if it won’t appeal to your workforce or your line of business, it will only equal dollars wasted. Once you get a good idea of the level of service you will need, you can start to compare different service options side by side. Here is your chance to really tailor your payroll services to what you do. Think about whether you would prefer traditional services, online services, or non-web based payroll software. Traditional payroll requires you to call, fax, or email your payroll hours on a specific schedule and wait for the return of paychecks and payroll reports. This option is reliable, as a payroll specialist is in charge of processing your information. Still, outsourcing all payroll processing responsibilities can be costly for some small business owners. Online services are ideal for basic payroll delivered with convenience. With online options you can access payroll information anytime, anywhere. Most reliable systems will help you with data entry and ensure your calculations are always correct. They also automatically update information in the event of changes in government regulations, which is a huge benefit if you aren’t savvy in this area. Online options worth your dollar offer well-rounded services like payroll processing, calculating and withholding of employee taxes, tax payments and filings, and new hire reporting. Online services work best for small businesses who have a confident payroll manager on staff who is comfortable using web-based systems. Payroll software that is not web-based is available as well, but you’ll want to read the fine print. You’ll still have the accuracy that web-based platforms offer, but you will likely be responsible for paying and filing tax information yourself. This might be a risk to a small business owner who has a lot on their plate already. Falling behind with this responsibility can lead to big trouble with the IRS. You also won’t get the benefit of automatic updates like those available on web-based platforms, meaning that you might be working with out-of-date information if you miss a software update. Most modern software programs do offer knowledgeable customer support and try to communicate important changes, but it is ultimately up to you to know if you have what you need. Payroll software that is not web-based is a cost-effective approach if budget is a major deciding factor. However, it is best left in the hands of a true payroll expert who is confident in handling the duties that software cannot perform. With payroll processing software (web-based or otherwise) you do get what you pay for. Avoid companies with a “too good to be true” offer. If you sacrifice quality for price, you might leave yourself vulnerable to major issues. Both web-based and non-web based payroll software programs are susceptible to issues when it comes to data security. However, if you work with a reputable company you can rest assured your employee’s private information is in safe hands (as long as your IT security is up to par too). Also, if you do decide to use more affordable payroll services, be sure you have a clear idea of your responsibilities and those of the payroll company. Some “cheap” plans only guarantee the accuracy of calculations or the accuracy of the forms provided; it is the customer’s responsibility to make sure taxes are paid and filed correctly. Before you say yes, know who is responsible for late tax payment penalties and late tax filing penalties too. Once you have narrowed down your choices for payroll services for small businesses, take a look at what others have to say. A simple Google search should tell you all you need to know about the reliability, quality, security, and convenience of the services you are considering. If payroll is not your area of expertise or if your staff does not include a dedicated payroll professional, look for companies that are applauded for their ability to answer questions, those that give you access to true payroll experts, and those that offer technology that is easy to use. Look for a company that has a team dedicated to helping you navigate the world of payroll processing. Find one that can meet the needs of your company today and as it grows in the future. Spend some time reading through the level of customer service they offer on their website and match it up to the reviews to see if they truly deliver. The only thing worse than a payroll service that is difficult to use or understand is one where there is no one there to help you when you’re lost. Although there are a lot of payroll services out there to choose from, finding the right option will be quick and easy. Just keep in mind the needs of your business, which type of product works for you, whether you are getting what you pay for, and whether the right experts are there for you. 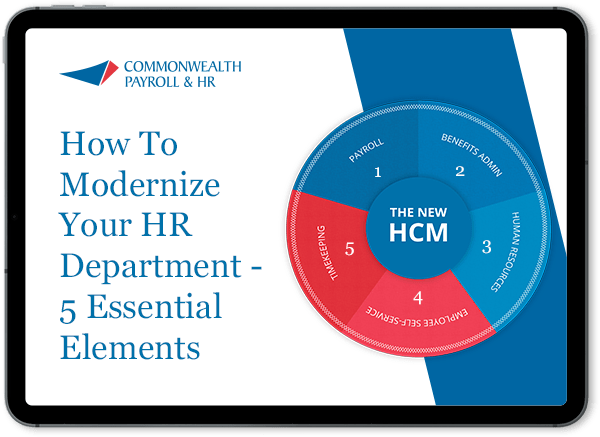 If you are looking for a company that can offer reliability, quality, security, and convenience to you and your employees, look no further than Commonwealth Payroll & HR. Contact us toll-free at 877-245-1159 to see how we can help you today!